Moon Types - Know the Reason (Jigsaw). What we are told - Here's yet another Jigsaw 7" from a new Swedish band, and like our previous one (by Animal Daydream - check 'em out! ), this one features a set of easy-going and jangly pop songs in the vein of fellow Jigsawers, the Zebras and Ocean Party, as well as Ladybug Transistor (check out the trumpet in the title track!) and some more hipper bands like Real Estate. Though "Know The Reason" is the obvious hit, due to its instantly catchy melody and bouncy feel, the other two songs are no less dazzling in their own subtle ways, from the descending chord progression in the chorus of "Nothing's Holy" to the haunting feedbacky/ebow-ed guitar melody in "Do It All Over Again". Jangle pop simple as that, easy on the ear and mind. A catchy song that pleases, more always welcome when they are performed this well. Connie Constance - debut EP "In The Grass" released 25th September 2015 on Black Acre. Some background words provided - Connie danced from a young age, having left school at 16, she moved to Hoxton where she began working professionally as a dancer, further opening her mind and soul to music through movement. In 2015 a friend introduced Connie to UK musician Blue Daisy, their friendship was instant and Blue swiftly became her producer and mentor. Together they set about carving a uniquely tripped-out sound. Wild dreams punctuated by stark reality. Ancient River - Keeper of the Dawn. The band's origins can be traced back the music scene in Gainesville, Florida and its thriving home grown DIY scene. Barreto began recording local bands, producing several albums as well as creating music for local independent films. 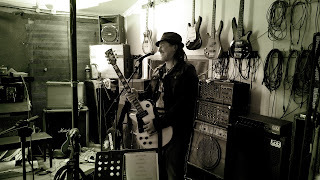 His house soon grew into a fully-fledged home studio/rehearsal space, where like-minded musicians could be found tirelessly sharpening their wide range of sounds, encapsulating everything from noisy shoegaze and psychedelia to classic Americana. Locked away in the pursuit of his sonic vision, it took two years for Barreto to take Ancient River to the stage, emerging with an unmistakable space-rock guitar sound and creating a captivating live show accompanied by entrancing psychedelic visuals. Well the bio has this to say - Turk Tresize is the embodiment of dusty backroads, Australian rock ‘n’ roll. Turk’s music drifts through the best decades of Rock ‘n’ Roll and takes his listeners on a story-telling trip through time. Raised on his family’s farm in Cannons Creek, Victoria, Australia, Turk is a music man that has embraced the hand that life has dealt him. Turk has managed to perform music across the globe, operate a successful annual music festival and launch a record label that released his highly-touted debut album, Soul Casino. He has accomplished this while fighting a deep-rooted battle for the family’s land. Turk continues to tell his intriguing story in the form of song with his sophomore album, If It Is to Be. 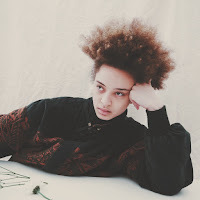 YOKOTA - Minimal Background - At 21 years old, singer-songwriter-producer YOKOTA, has released her indie-pop single 'Blindside' fusing elements of elements of soul, jazz and hip hop to create her her poppy brass fueled single. 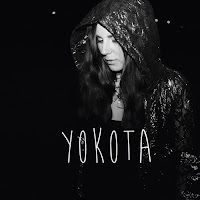 Currently recording in her home studio on Sydney's north side, YOKOTA's debut EP is set to thread these common elements and will be unleashed later in 2015. So this really has to be a case of letting the music do the talking, which is fine. Actually it's a whole lot more than fine as I am sure you will find out, so give this totally enjoyable song a listen. Paul Mac "Anechoic [Everybody's Singing]" (feat. Tim Derricourt) - Love Club vs Stereogamous. I tried a little experiment. I had an idea for a song called 'Anechoic'. I was looking for a collaborator to bounce ideas off. One of my favourite whimsical vocalists is Tim Derricourt (Dappled Cities). We workshopped the concept and came up with a kind of choir of lovers leaving planet Earth, singing in space where no-one can hear you, but it feels good. Letting go and drifting into the unknown. Or something like that! It made sense at the time. Dark and light, broody and moody and upbeat all rolled into one. Official website (here).